Bidwells is a national property consultancy that celebrated its 175th birthday in 2014. Following on from our successful advertising work (see ‘CIPD awards), we were asked to design and build their new recruitment site. Bidwells is a privately-owned, independent business with a non-hierarchical structure when compared to their competitors. Their recruitment website, however, could best be described as ‘functional’ and did not reflect any of the positive brand messages that we knew could help them attract good applicants. An additional challenge for this project was to develop a site that could sit on their existing content management system. We did an initial audit of the existing careers website to highlight the potential improvements and ‘quick wins’ that could be achieved by investing in the site. The property sector is extremely competitive and Bidwell’s were potentially missing out on candidates by not telling their story or explaining their employer value proposition. We designed a responsive recruitment website that mirrored their existing corporate site design but used new people profiles and client-supplied imagery to tell the story of a business that offered a entrepreneurial culture that was driven by the team and not ‘PLC’ shareholders. We grouped role explanations into three logical sections – Graduates and Placements, Partners and Professionals and Business Support roles – to make it easier to navigate and added the key propositions identified through an extensive initial briefing process. 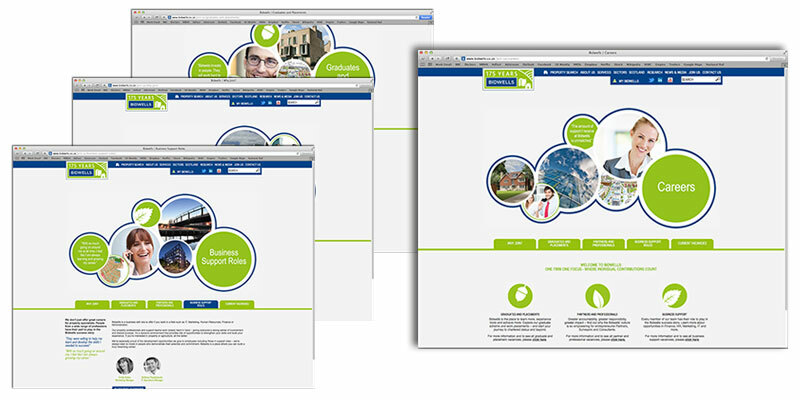 The website was then built on their existing CMS platform – Concrete 5 – which enabled us to ‘hand over the keys’ once it had been completed for the client to make future changes and updates. The site (www.bidwells.co.uk/join-us/careers) launched in 2014 and continues to be the platform for all applications to Bidwells. Since launch, recruitment videos have been added as the business continues expand its operations across the country.